JoinGram is a cool free video maker is full of unique features. Mainly, it can be used for creating fun collages and videos of anything you like. All you got to do is select photos from your phone gallery and then customize everything as you wish. For instance, you can choose one of the ready-made templates, add special effects and filters, colored text, you can add music from your music library, etc. When you’re done, you can share your masterpiece with your family and friends on any social networking site you’re using or save it on your Android device. 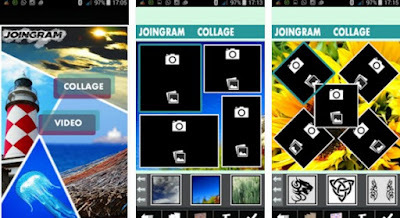 With these awesome features and many more, JoinGram can be downloaded for free from Google Play. Get this free video collage maker it now and enjoy professional results!